Our hostess this week is Debby Harriettha who has made this beautiful arch for our challenge. Debby selected the theme “Garden Fairies” for our inspiration. What comes to mind when garden fairies is mentioned? We want to see your art this week in gothic form. 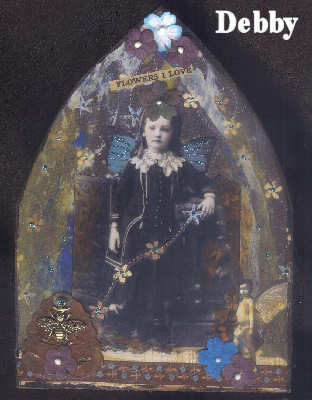 I started the mixed media craze with a rubber stamp, about 5 years ago. I became a wandering lost soul after I lost my parents which led me into my local stamp/scrap store. I was amazed when I walked in and saw what they had to offer. I immediately signed up for a stamping class and I was hooked. One thing led to another and the stamps do not come out all that often anymore. I am totally hooked on mixed media today and I have a real passion for doing altered book round robins. This being said it has brought much happiness to my life and I have met so many friends online. I have chosen Garden Fairies for my theme this week. Have fun!!! Looking forward to all the great garden fairies.. I looked in the Garden but they could not been found, so I made one myself. Another great theme for this week !! Here’s a reproduction image of the view I saw in one day in the fairy ball in my garden. It’s about th 4th post down on my blog as I originally made it for Earth Day. Hi! Here are my garden. Enjoy, I hope. Great theme, specially for the first day we could sit outside here in Scotland, basking in sunshine. Here is my garden fairies. It’s a very nice theme Debby. Thank you for another fun week!! Here is my ‘Garden Fairy’ taking a nap!! Hope everyone is enjoying this week’s theme. I have added mine here. I can’t seem to attach llinks so I’ll just let you know that mine is on my blog. Sorry about that….don’t know what is happening. My garden fairy is on my blog, can’t get the link on this blog! Thank you for this theme Debby!! I love fairies!! I can’t seem to leave a link either but my arch is on my blog!! I am not sure what is happening with this site, but if I haven’t commented on your arch it is because I either can’t get into your blog, or once I do I cannot leave a comment. I hope I haven’t missed too many, but the ones I have seen so far are just gorgeous. Thanks so much for playing. My entry is on my blog! Many thanks to all the wonderful people that and left such nice comments, you made me feel very welcome! Here’s this weeks entry, happy creating!